UPDATE!! Unfortunately, OBE Port-Of-Call General Store has recently closed in the Waveland Business Center and is not expected to reopen. 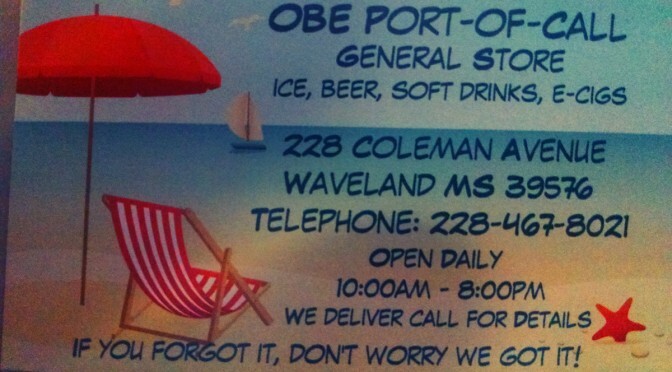 OBE Port-Of-Call General Store just opened up in Waveland, Mississippi and they have all kinds of goods for your beach trip or ride home. They have milk, eggs, ice, snacks, E-cigarettes, beer, drinks and more. They even have beach items! Gary from Old Blue Eyes has opened his new shop and it’s a great addition to the Beach area off Coleman Avenue in Waveland, Mississippi and to the community south of the tracks. 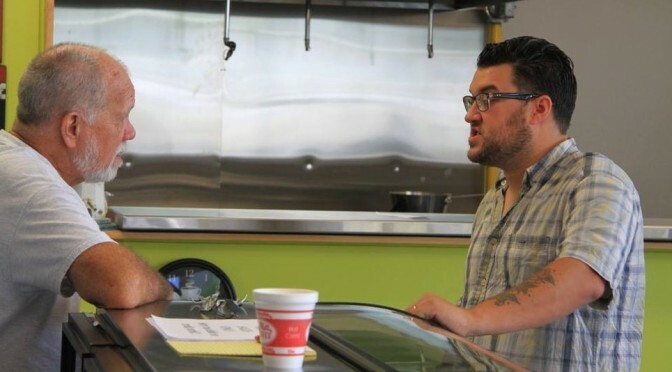 We’re so excited he’s here right next door to our offices, and we love having him as a neighbor and fellow community small businessman. Come on down and grab a case of beer and some sunglasses. We Deliver – Call for Details! NOTICE: MINDY’S CAFE HAS CLOSED UNTIL FURTHER NOTICE. Coastal 90 stopped by Mindy’s Cafe recently on Blaize Avenue in Bay St Louis, Mississippi, and let me tell you, we loved it! The atmosphere was pleasant; the food is delightful; and best of all, the service is spectacular! Mindy Feverston, local restauranter, has opened up a wonderful addition to the Bay St Louis community, Mindy’s Cafe. Everything we ordered from the Double Down Burger to the House Salad with Shrimp was great. The burger comes with fried bacon and an egg, which to me is heaven. I’m hoping that everyone can stop in to this local treasure, because you’re sure to be pleased. The shoestring fries were crispy and hot, and even the after dinner chocolates were sweet and a nice treat. I know I’m making your mouth water for one of these gems. They even have draft craft beers from all over the country, including our own Lazy Magnolia. They also hand make their burgers and hand cut their fries! YUM. 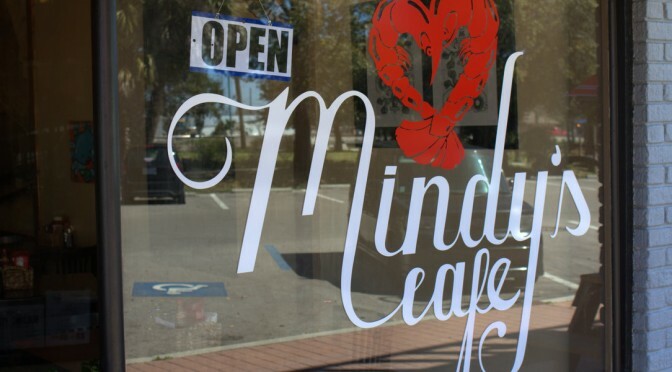 Located at 126 Blaize Avenue in gorgeous Bay St. Louis, Mississippi, Mindy’s Cafe is across from the Historic Train Depot a few blocks from the beach and St Stanislaus. This cute restaurant brings you back to the New Orleans French Quarter with its bright iron lamps and quaint feel. This family diner has everything to offer from salads and appetizers to gator sandwiches and seafood platters. It’s all to die for. Located in the Historic Depot District, it’s very easy to locate and park off the street. You can order take out or sit indoors and outdoors, and with the weather as nice as it was today, you’ll want to sit outside. Make sure to get down to Bay St Louis and enjoy the smooth air, the lovely people and a nice afternoon or evening at Mindy’s Cafe. Check out the Mindy’s Cafe Facebook Page! Sometimes you’re just in the mood for some good, messy, casual dining…when that happens, you should make your way down to Sloppy Dogs in the Depot District of Bay St. Louis. Their motto is “Best Hot Dogs in the World,” and they sure do live up to that statement. Their offerings of a variety of different hot dog combinations, their famous Philly cheesesteak sandwich, and their slew of draft beers lure even the biggest foodies on the Coast to this down-to-earth establishment. C & R’s Bar & Grill Hamburgers that Rock! 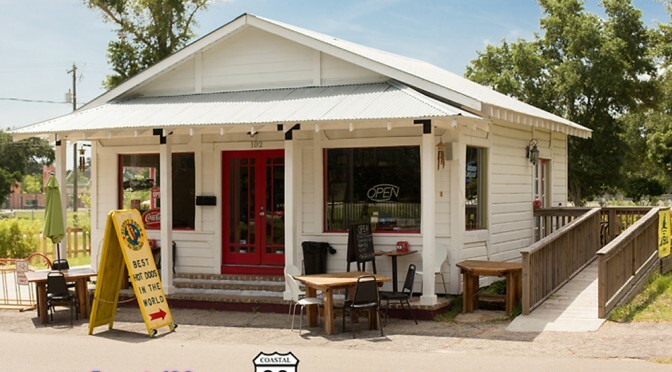 C & R’s is located on Coleman Ave. in Waveland, Mississippi. Its about half way down the street and is the ONLY restaurant/bar on Coleman. They re-opened their doors after Hurricane Katrina on December 1, 2006. The atmosphere is more bar than grill, but they have got a ½ pound Burger that is out of this world. It was thick, juicy and HUGE. The owner, Nadine, really knows how to cook up some delicious meals.